Dry shampoo may be the best invention since the eyelash curler when it comes to stepping up your beauty regimen. It cuts down on your morning routine giving you a reasonable excuse to hit the snooze button a few more times. It’s also a handy tool if you like to squeeze in a midday workout. Dry shampoo absorbs the natural oils from your scalp that weigh down your hair, giving it a greasy look. It can also be added to clean hair to amp up the volume and add texture. Here are a few key tips to apply powder dry shampoo to look natural, not like you’re wearing a powdered wig from the 1800’s. If your hair is still a bit damp from a work out, flip it upside down and blow dry for a minute or two to remove moisture. Dry shampoo + moisture = paste (not a good look). Part your hair about 2 inches to the left of your natural part, lightly sprinkle the dry shampoo onto your roots (Use a light hand! You can always go back and add more). Repeat on the right side and then down the natural part of your hair. Flip hair and massage dry shampoo into the roots, blending well. Another option is to sprinkle dry shampoo into the palm of your hand and rub hands together to thinly coat with powder, then run them through your roots starting at your hairline. For a quick touch up, apply dry shampoo at your hairline and down your part with a powder brush lightly dipped in dry shampoo. Danielle Haun, founder of DAYS + NIGHTS Organic Dry Shampoo recommends applying dry shampoo before bed if you’re a newbie. That way the powder is better able to blend through the night to avoid an over powdered look. A quick touch up in the morning for added volume and you’re good to go. Enjoy those extra minutes of sleep! 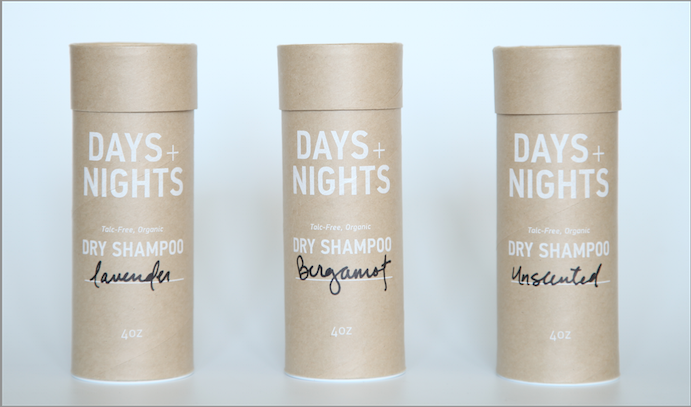 DAYS + NIGHTS Organic Dry Shampoo full size bottle is available in the Clean Beauty Box, REFRESH. Check it out here.